School is in session once again. There's no better stress reliever than crochet to wind down in the evenings after helping the kids with their homework. 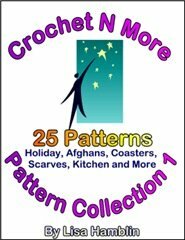 At Crochet Pattern Central you can find tons of pattern links for just about any type of project you can imagine. 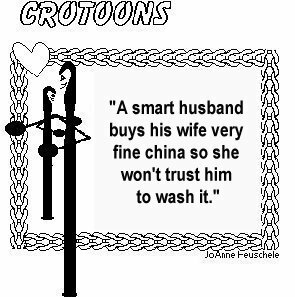 I need the pattern for crocheting a kitchen scratch pad. It is made of a type of netting, is round and is excellent for pots and pans. Therefore everyone who hears these words of Mine, and acts upon them, may be compared to a wise man, who build his house upon a rock. And the rain descended, and the floods came, and the winds blew, and burst against that house; and yet it did not fall, for it had been founded upon the rock. And everyone who hears these words of Mine, and does not act upon them, will be like a foolish man, who built his house upon the sand. And the rain descended, and the floods came, and the winds blew, and burst against that house; and it fell, and great was its fall. According to the grace of God which was given to me, as a wise master builder I laid a foundation, and another is building upon it. But let each man be careful how he builds upon it. For no man can lay a foundation other than the one which is laid, which is Jesus Christ. Now if any man builds upon the foundation with gold, silver, precious stones, wood, hay, straw, each man's work will become evident; for the day will show it, because it is to be revealed with fire; and the fire itself will test the quality of each man's work. If any man's work which he has built upon it remains, he shall receive a reward. If any man's work is burned up, he shall suffer loss; but he himself shall be saved, yet so as through fire. Do you not know that you are a temple of God, and that the Spirit of God dwells in you? If any man destroys the temple of God, God will destroy him, for the temple of God is holy, and that is what you are. "BUILD YOUR LIFE ON THE SOLID FOUNDATION." This quote is from Our Daily Bread - August, 2008 Issue. but in his spirit he speaks mysteries. Patterns sometimes refer to a chain space.. it can be chain 1 or any number/serices of chains. Ch-1 sp is the same as chain one space. Ch2-sp is the same as chain two space. If a pattern says "sc in next ch-1 sp" then you do a single crochet in the next chain one space (the next space where you previously chained one). Work the stitch into the hole below the chain... not directly into the chain itself. If a pattern says "sc in next ch-2 sp" then you do a single crochet in the next chain two space (the next space where you previously chained two). Work the stitch into the hole below the two chains... not directly into either of the chains. Carry a purse or tote that is large enough to accomodate a crochet project. This will ensure you always have something to work on if you have to wait for any reason. Put the project supplies in a ziplock bag to keep them clean while you carry them around. And... when the kids toss out that old pencil box for a new one... use the old one for your hooks and other crochet notions. do you have number 54? I am a beginner and I appreciate your web site. However, after reading your explaination over and over, I still don't understand what my pattern means when it says, "dc ch-1 space." I'm not getting the meaning of "ch-1 space, " and your explanation "the next space where you previously chained one" doesn't make sense. What do you mean by "previously chained one"? What does "chained one" mean? The row prior to this one included chain stitches. When the pattern instructs you to work a stitch in the next chain 1 space all that means is you work that stitch into the hole below the next chain on that row. Does that make sense? Thank you for your answer, Lisa! I actually figured it out, but I'm so glad that you responded to my email. Your web site is extremely helpful. I began crocheting as a teen, but never had formal instruction or used patterns. I learned one stitch and made a small blanket. Now I have books with various stitches and am learning to read patterns. I appreciate your help. I love your website and have been getting the newsletter for awhile now. I keep at least 4 crochet projects going at one time. Anyhow, I love it so much a wrote a poem about crochet and thought you might like to read it. Sorry to hear about your Mother's illness. I hope one of these products will be of assistance to her. You may be able to place the yarn guide on one of the fingers of the bad/injured hand and then hold your hook with your good hand. "The Cro-Knit slips easily onto your finger to make your stitches more uniform and the yarn easier for you to handle. Adjustable device works equally well with 2,3 or 4-ply yarn. Plastic tension ring holds the yarn securely in place." I didn't however see a beanie cap for a teen boy...Looked everywhere if someone can help it would be greatly appreciated...Something in the easy range...and could someone tell me what the abbreviation tog stands for...Thank you ever so much!! Tog is the abbreviation for "together". Hi My Name is Yolanda, Yoli for short. In Florida!!! I am soooo frustrated. I learned how to crochet when I was about 10 years old and have crocheted off and on most of my life....44 now...anywhoo....lol!!! I really have the crochet fuzzies and am trying to master the granny!!! I dont know where Im going wrong, but I get lost when I hit that second round.Am i supposed to slip stich always on the 3chain and then slip stitch over the dc's and then start onthe first chain space (inside of it) or outside of it.....My goal is to make one big granny square blanket, and am very frustrated...Please help!!! Yoli R.
I always join with a slip stitch and then chain 3 and turn the square over for the next round. Row 2: Ch 3 (counts as first dc, now and throughout), turn; 2 dc in same st, * skip next 3 dc, ( sc, 3 d) in next sc; rep from * across to last 3 sts, skip next 2 dc, sc in top of beginning ch. Repeat from the asterisk across the row to the last 3 stitches. You can join crochet pieces any way you like. Hope you find a method you enjoy. Hi, I am trying to follow your pattern for the toilet tissue holder. I have gotten to the 6th row, but I am having touble with the 7th row. Can you help? Thanks Barbara. For Round 6 you worked in the front loops. For Round 7 you work a single crochet in the unworked loop of each stitch on round 5. This lady suggest taking the instructions and mirroring them. Then I believe it would be ok to work left handed. 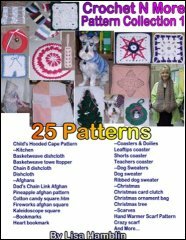 I believe most patterns can be made by either left or right handed crocheters. Only those with letters or designs that would be backward need to be "mirrored". How is embellished embroidery done and crewel embroidery done. Is it done with a machine? How is it different from regular embroidery? I've seen some embroidery that was embellished but I haven't found instructions for such. He said, "Call for backup." Jim: "How did you get that bruise on your arm?" Joe: "I ate some candy." Jim: "Eating candy won't give you a bruise." Joe: "It will if it's your big brother's candy!" This Christian couple felt it important to own an equally Christian pet. So, they went shopping. At a kennel specializing in this particular breed, they found a dog they liked quite a lot. When they asked the dog to fetch the Bible, he did it in a flash. When they instructed him to look up Psalm 23, he complied equally fast, using his paws with dexterity. They were impressed, purchased the animal, and went home. That night they had friends over. They were so proud of their new dog and his major skills, they called the dog and showed off a little. The friends were impressed, and asked whether the dog was able to do any of the usual dog tricks, as well. This stopped the couple cold, as they hadn't thought about "normal" tricks. Once more they called the dog, and they clearly pronounced the command, "Heel!" Busily checking in luggage for the large airline where I work, I asked every traveler, "Is this your suitcase?" before proceeding. "No, it's my brother-in-law's -- but he said I could use it." A six-year-old comes crying to his mother because his little sister pulled his hair. This time the sister is bawling and her brother says, "Now she knows." Knowing nothing about that particular condition, she double-checked with Doctor Mike Wilson. One day, while pointing to a little boy's ear, the doctor asked him, "Is this your nose?" Immediately the little boy turned to his mother and said, "Mom, I think we'd better find a new doctor!" When the plate went by a little boy, who was attending church for the first time, dropped a penny in, then asked his mother, "What will come out of the plate, bubble gum or licorice?" A local priest and pastor stood by the side of the road holding up a sign that said, "The End is Near! Turn yourself around now before it's too late!" They planned to hold up the sign to each passing car. "Leave us alone, you religious nuts!" yelled the first driver as he sped by. From around the curve they heard a big splash. "Do you think," said one clergy to the other, "we should just put up a sign that says 'bridge out' instead?" Jim was just falling off to sleep when his wife nudged him and said the telephone was ringing. At this hour it was probably for him, she said, closing her eyes. Jim rolled out of bed and trundled downstairs. When he returned, his wife was asleep. He woke her. "Wasn't for me, after all," he said. She crawled out of bed and pulled on a robe. Then he added, "It was a wrong number." A policeman stops a speeding car and tells the woman driver; When I saw you driving down the road, I thought to myself, "sixty-five at least." The woman replied: I don't think that is quite fair. I think this hat makes me look older. A little boy wanted $100.00 very badly and prayed for weeks, but nothing happened. Then he decided to write God a letter requesting the $100.00. When the postal authorities received the letter to God, USA, they decided to send it to the President. The president was so amused that he instructed his secretary to send the little boy a $5.00 bill. The president thought this would appear to be a lot of money to a little boy. The little boy was delighted with the $5.00 bill and sat down to write a thank-you note to God, which read: Dear God: Thank you very much for sending the money. However, I noticed that for some reason you sent it through Washington, DC., and those guys deducted $95.00 in taxes.